Primrose - modern and minimalist, our handmade contemporary kitchens are particularly well suited to modern loft style living although the clean lines also sit happily in a more traditional setting. Boldly minimalist, the Primrose kitchen is a stunning contemporary addition to our more classically traditional kitchens. This versatile range is available in walnut, bamboo, oak, ash, maple and birch veneers as well as matt and high gloss laminate and solid acrylic. 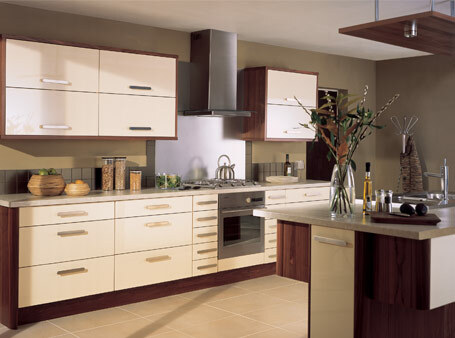 < Hi gloss acrylic and walnut furniture with Latte Caesarstone and walnut worktops.